We passionately believe that technology is here to improve people’s lives and their environment and so it is with the Clear Heater System. A trained installation team will be needed to carry out your CHS installation to ensure the Clear Heater Units are positioned to achieve optimal heating. No complex plumbing or wiring is required; they simply fix to a wall and plug into a wall socket. 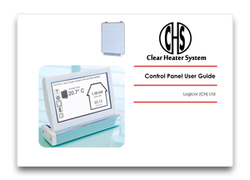 If you have any further questions please read through our help sections below, download the Clear Heater User Guide or get in touch with our design team. We've listed below the most frequently asked questions from our customers. If you have another question regarding our heaters try searching our website with the search box. 1. What amount of energy saving can you expect to see from the system? The amount of energy used in your home to heat it represents approximately 66% of your total annual energy spend. Of that the system will save you approximately 50% or greater. Some customers have achieved well into the 80% mark. We would advise a greater than 50% saving can be expected. It is important to compare like with like. 2. I have an oil fired central heating system. Will the Clear Heater System save me money too? Yes you will save money as well and again you can expect to see a saving of 50% or greater. Again it is important to compare like with like. 3. I’ve installed the system and it looks as if I am going to pay more than before. Your system will save you money over the 12 month period but may show a higher running cost on some days in cold months. This is normal and it will balance itself out over the year. 4. The system is showing an instantaneous running cost of £0.50 that will cost a fortune to run the system. If I multiply this out over a 12 month period is this figure accurate? The instantaneous cost displayed on the system is akin to an instantaneous petrol consumption reading in a car. When the system is working hard it will show a higher running cost when compared to when it is not. The instantaneous reading is only provided for guidance. The actual consumption figure for that day of the month can be displayed on the Control Panel should you wish to see that. 5. I have 8 Clear Heaters in my house and no matter what I do I only ever get two of them to come on at the same time. All of the others are cold. Is this normal? Yes this is normal. The system runs economically because it is able to heat your whole house by only switching on a small number of individual heaters at a time. 6. I have no internet; will the Clear Heater System still work for me? Yes it will. The system only uses the internet for updating, weather forecasting and things like data transfer. It will not affect the running of your system not to be connected to the internet but, it is an advantage to have it because it will allow some higher end functions to work better. 7. How long will the system last me? The Clear Heater System was built to give you a minimum of 20 years trouble free service. It was designed to last much longer than that. For example the element has a life expectancy of 300,000 hours. 8. What can I clean the heaters with? You can use a normal glass cleaner on a micro fibre cloth. We also have our own cleaners which you will be able to buy from us or your local distributor. 9. Can the Clear Heater System run just like a normal central heating system and turn on and off with a timer? Yes the system does have a timer which will allow you to turn it on and off just like an old fashioned central heating timer. The timer on this is quite sophisticated and can do a great deal more than a standard central heating timer should you wish to utilise the system this way. Please note that under some circumstances this will cost you a great deal more to run than leaving the system on and in automatic mode. 10. Is it true that the system is on 24 hours a day every day and if so why? Yes, the system runs 24 hours a day 365 days a year. It does this so that your home can maintain the desired temperatures in your home automatically. In tests it has worked out cheaper to do this than to utilise the system in any other mode. 11. I only have a fixed amount to spend on heating my home each day. Can the system help me in this area? Yes, the Clear Heater System can be set to limit spend on a daily or monthly basis to suit your budget. That way you will never have an unexpected bill. 12. Can I really set the temperatures in each of my rooms to a tenth of a degree? Yes you can set the temperatures in any of your rooms to between 10°C and 30°C in increments on 0.1°C. 13. Can the system replace any normal conventional heating system? Yes it can but, you will have to make a decision about taking your old system out prior to installation or not. 14. Are my heater placement options limited to those of a standard heating system? No, unlike other systems you can mount a Clear Heater almost anywhere in a room that you wish. In our offices we have heaters at eye level and we use them as white boards so they can be very useful in other areas. 15. Are they available in any other colours? At the moment no, the only option is white with a chrome trim. In the future you will be able to choose to have the chrome in one of nine different colours. Also the heaters will come in a variety of colours, not just the standard white. 16. I’m not technical and it looks difficult to operate. Can anyone use this system? Yes the system is trained to operate in automatic mode and in that mode it requires no human input at all. Your engineer will set it up for you and you can leave it to do its job for you. You can of course change your settings if you want to at any time. 17. Where do I get my spare parts from if I need any? It is unlikely that you will need any but should you require anything contact your distributor or installer for spare parts. 18. Can anyone install the system or do they require training? In order to install or commission a Clear Heater System an installer would have undergone a five day training course provided by Logicor and would need to have attained a pass rate of over 90%. The same is true for the person that commissions your system. This ensures you always get the best service and the heater units are positioned to achieve optimal heating. 19. Can I dry my clothes on the heaters? No you cannot. Either use a clothes horse placed about 30cm from the heater or you can buy a special heater mounted clothes horse. 20. Do the heaters make any noise? No, the heaters do not make any noise at all. They have no moving parts but, sometimes very occasionally, you can hear a very faint clicking noise as a heater expands and contracts. This is quite normal. 21. Can I paint the heaters to match my room? Yes you can but don’t use gloss or enamel paint. Use a standard emulsion and be careful to turn your heater off before you commence painting the heater. 22. Will the system need to be re-programmed if I have an electrical power outage? You will not need to re-programme the system in the event of a power outage. It will remember all your settings. 23. Are there any user serviceable parts on a heater? No there are no user-serviceable parts on a heater or the Control Panel. If you damage the system in any way please contact your distributor for assistance. 24. Can I take my heater off the wall myself to paint behind it? You can paint behind a heater without taking it off the wall by undoing the two brackets and leaning the heater forward by about 30 degrees. Take care not to let the heater fall. 25. How hot does the surface of a Clear Heater get? The normal operating temperature of a Clear Heater is 60°C which is comparable to a wet system. The surface temperature can be adjusted down to 40°C or right up to 100°C via the Control Panel settings but by reducing the temperature you will reduce the efficiency. 26. What do I do if I have lost my User Guide? The current User Guide is available on our website to download. Alternatively press the Help Icon “?” on your Control Panel to receive helpful tips at any time. 27. How many heaters can be included on one Clear Heater System? The commercial version of the Clear Heater Control Panel will operate more than 32 heaters at a time but the domestic version is limited to 31 heaters. 28. Why is the Control Panel screen black and white? Although the Control Panel is a full colour screen the field trials have shown that the black and white screen is clearer and easier to see without glasses. 29. I’ve dropped my Control Panel and broken the screen. Will my system stop working? Your system will continue for 11 days without a Control Panel after which it will stop working totally. During that time please seek a replacement or contact your distributor. 30. Can Logicor see my how my system is performing remotely? Yes, Logicor can see a data feed giving performance characteristic data from each heater unit. 31. Can I place a Clear Heater behind my sofa? You can but, that would reduce your heaters performance dramatically. Logicor do not recommend you do this. 32. I have scratched my heater with my engagement ring whilst cleaning it; what should I do? If you scratch the surface of a heater in any way turn it off immediately and contact your distributor. The heaters are made of toughened glass and if you scratch one you will create a weak spot that may cause the heater to shatter at that point. 33. Does the Control Panel operate the InLine Hot Water system due in 2016? Yes, the Control Panel will also be able to control the InLine Hot Water System. 34. I have a Netgear WM3000RP Wifi range extender and when I use it with my Xbox and play games will it interrupt the communication with my Clear Heaters? Using a Wifi range extender for laptops and phones has not created any known problems but we have experienced some communication issues with this particular model when playing games on an Xbox. This could disrupt communication to some or all of the heaters in your home whilst you play but, this will not damage your Clear Heater system. If disruption occurs, your Clear Heaters will go into “Independent Mode” which means they will operate normally without reducing performance during the disruption up to a maximum of 11 days. During that time you can use their manual adjust button to alter the temperature up or down to suite your needs. Once you have finished playing your game, remove the Wifi extender from the mains or switch it off at the mains. Next, turn off all of your Clear Heaters in turn, wait 5 seconds and then turn them on again. Normal communication will be resumed. 35. I’m a Virgin Media customer and my Virgin router has an issue connecting to the Control Panel. What I can do? Some Virgin Media routers have a secondary firewall so you should consult your router manual to resolve that. - The 802.11 b/g Wifi standards are supported. - The following secure authentication schemes are supported WEP/WPA/WPA2. - The space character is not supported in SSID mode so check that your password does not have a space in it. If it does you need to change your password to remove the space character. 36. I am experiencing communication issues when I use an old four-way extension lead with surge protection. Why is this? Some surge protection circuits in some devices can have an impact on communication with the Clear Heater Control Panel. This manifests itself in the loss of communication between the control panel and a Clear Heater unit. This can happen for example with some PC’s, printers or extension leads which have in-built surge protection. The effect of this type of device on communication is very limited in range so the solution is an easy one. The solution is to plug the device into another socket further away from your Clear Heater unit or move the heater unit itself. In the case of an extension lead, another solution could be to purchase a new extension lead without surge protection circuitry if appropriate for your application or alternatively, try an extension lead with surge protection from an alternative supplier. Note, that whilst not all surge protection circuits effect communication with the control panel there is no real way to know in advance which device will cause a problem or not; simply changing the extension lead may not solve the problem. 37. I have been approached by a company to fit a reflective strip to the back of my Clear Heaters which they say will make my heater more efficient; should I go ahead and fit them? No you should not. To fit a reflective strip on a wall at the back of a Clear Heater could lead to an increased temperature between the wall and the Clear Heater. This can lead to a heater malfunctioning in an unpredictable way. If you have already fitted these you should contact the company who has supplied them and have them removed until tests can be carried out to ensure that they are safe to install behind a Clear Heater. 38. I have been approached by a company who say that they are working with Logicor and the product that they are selling are either Logicor products or Logicor approved. Is this true? If you are in any doubt please call Logicor on 01924 385659 or contact technical support on techsupport@logicor.co.uk and seek clarification. Logicor does not sell third party products nor does it market them so please feel free to verify the credentials of anyone who purports to be linked to Logicor in any way.